In a French oven, sauté onions and garlic in butter over medium heat until translucent. Stir in tomato paste and cook while stirring until it starts to brown. Pour in the chicken stock and scrape the bottom of the pot with a wooden spatula or spoon to remove any caramelized brown bits. Add both cans of tomatoes, including juice, and bring to a boil. Reduce the heat and simmer for 10 minutes. 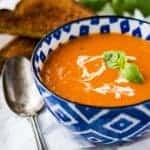 Use an immersion blender to puree the soup right in the pot, or transfer the tomato mixture in batches to blender or food processor to process. After mixture is pureed, add in basil and pulse a few times to incorporate. Then whisk in heavy cream and add additional salt and pepper to taste. Store leftovers in the fridge for up to 5 days or freeze for up to 3 months.